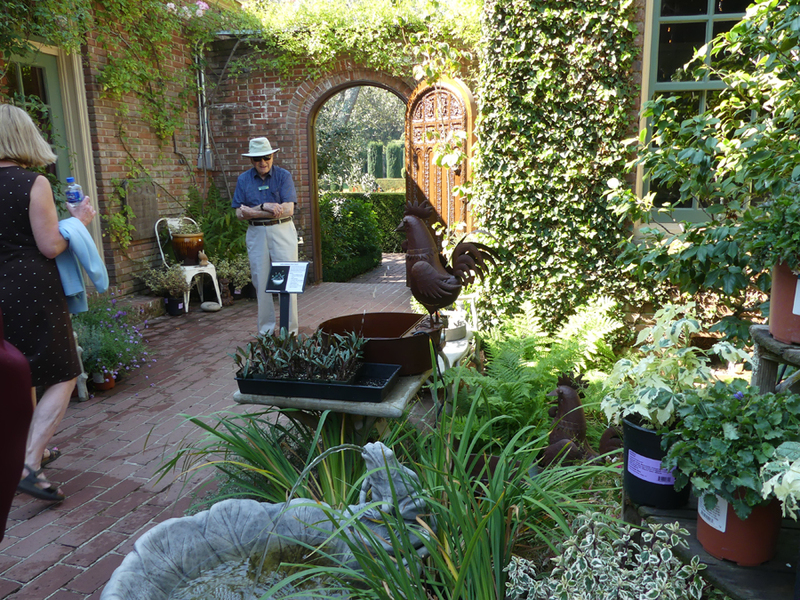 Filoli Mansion and Gardens is a bit off the beaten path and way out of the ordinary. It's near Woodside about 25 miles south of San Francisco. Many visitors might miss it. Big mistake! This is one of California's real treasures with the emphasis on real. 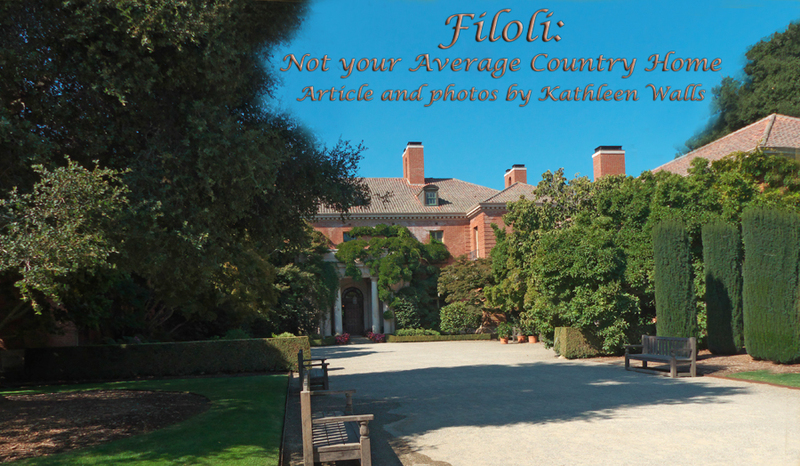 Filoli is a California Historical Landmark and is listed on the National Register of Historic Places. Of course the beautiful mansion is a big eye catcher. If it looks vaguely familiar, it may be you are remembering it as the exterior of the Carrington Mansion in Dynasty. But remember that "gardens" in the name. 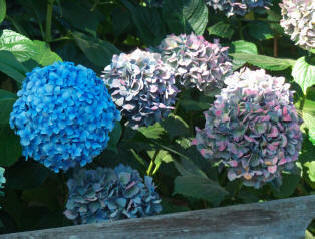 They are much more than flowers and ornamental shrubs. 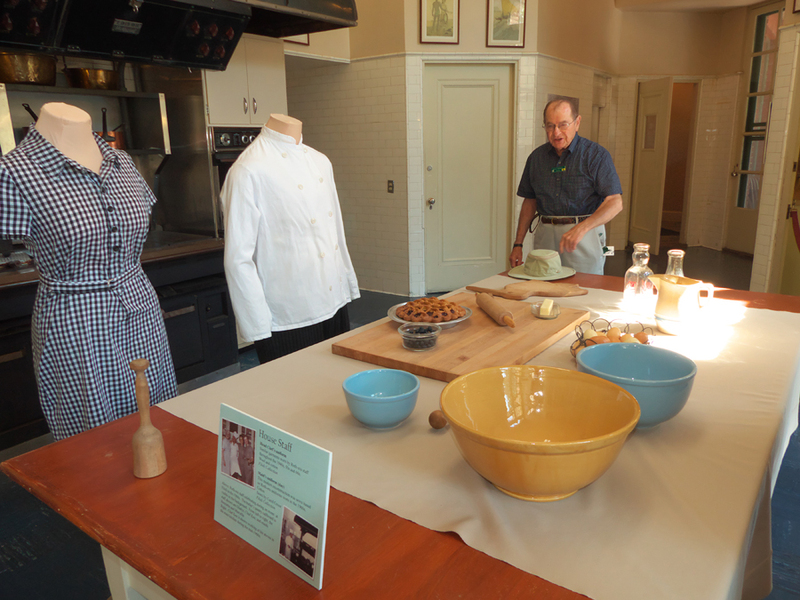 We realized that as soon as we met Charmaine Moyer, Herb and Vinegar Committee chair, who told us about the herbs and spices grown in the mansion gardens. Before we began the property tour, we got an inside look at their Herb and Vinegar Workshop. The spicy sent and the exhibit of actual fresh herbs was fun but it got even better with a tasting. 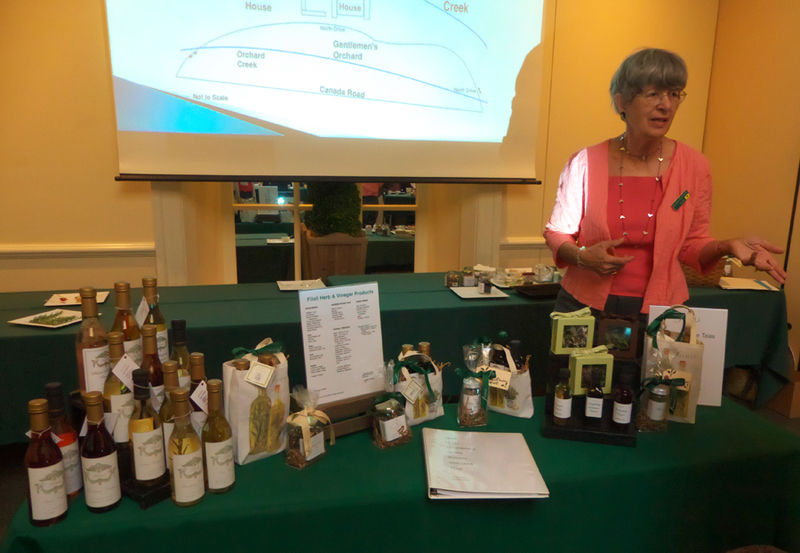 The samples included items like Herbs de Province, French Tarragon, Notorious No Salt, Chimichurri, several of their herbal vinegars, and their two salts; Knot Garden Salt and Woodland Salt. We washed it all down with a sampling of their herbal teas. There was a beautiful heirloom apple at each setting. Charmaine told us, "We have the largest heirloom orchard in private hand in the United States. … We donated the fruit to food banks after our Autumn Festival. We have fruit tasting at the festival and there is no place else in the world you can taste so many rare apples and pears at one time and place as at our Autumn Festival." Bob French, the docent who led us through the house tour, answered our questions about the source of the unusual name. "It was from William Bourn's motto ‘Fight for a just cause; Love your fellow man; Live a good life.' He took the first two letters from the main words." 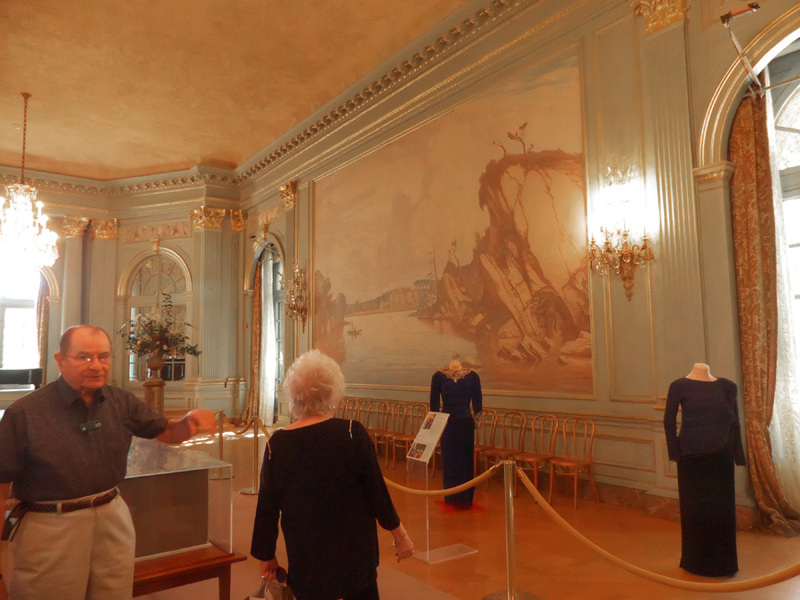 Bob French explains to a visitor about the mural in Filoli's Ballroom and costumes of the era. Bob gave us some background on the mansion as we toured. Built by the William Bowers Bourn II family, it shows the early 20th century lifestyle at a country home; a lifestyle for those at the top-most peak of the cream-of-the-crop millionaires of the era. Mr. Bourn owned a gold mine and much of California's water rights. It is a breathtaking example of what unlimited wealth and the desire to show it off could achieve. It is preserved with much of the original furnishings. There is so much to see that I am just going to give you a taste and then tell you go see for yourself. From the moment I stepped into the foyer, I felt as if I were transported back in time. One of the first things I noticed was the maid's costume on a mannequin. This attention to clothing of the era is consistent throughout the house. It makes you feel connected to the time. Another custom of the era is the distinct separation of men's and women's place in society. The separate ladies' and men's cloakrooms are very different in style. 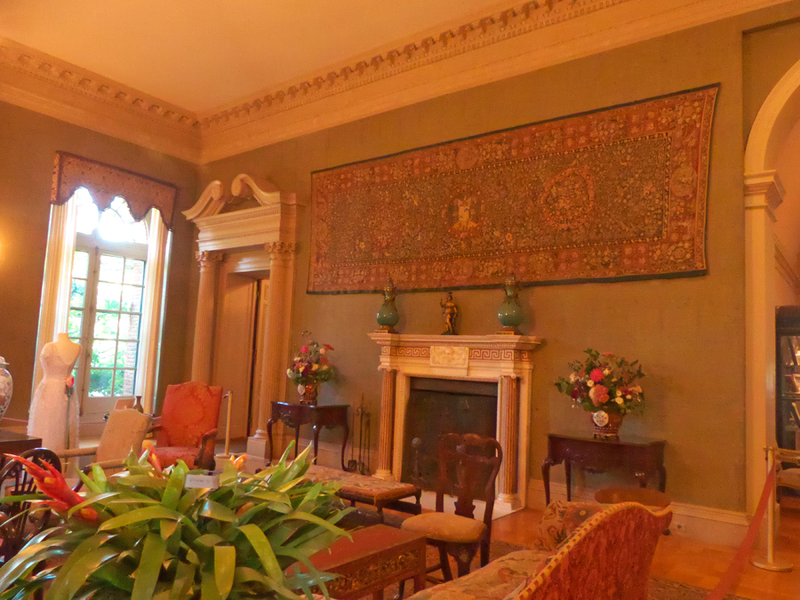 After a guest stowed his or her coat, they progressed on to the Reception Room. It is so huge it is easy to imagine hundreds of well dressed guests mingling. They might have warmed themselves in front of the elaborately decorated Italian marble firplace and noted the 16th century Flemish tapestry hanging above it. Or perhaps they perched on the overstuffed sofas and chairs clustered about the room on the Tabriz rug. They would not have had the opportunity to admire the twelve-panel antique Chinese palace screen that occupies almost the entire opposite wall today. Should you step into the library through the side door, you could picture yourself caught up in a Gothic romance. This the exact type of library where the heroine would tryst with the hero. The entire house if filled with opulence hard to imagine living with on a day-to-day basis but beautiful to explore on a tour. When you move into the Trophy Room, originally a men's lounge, you are in the era of the Roths' ownership. 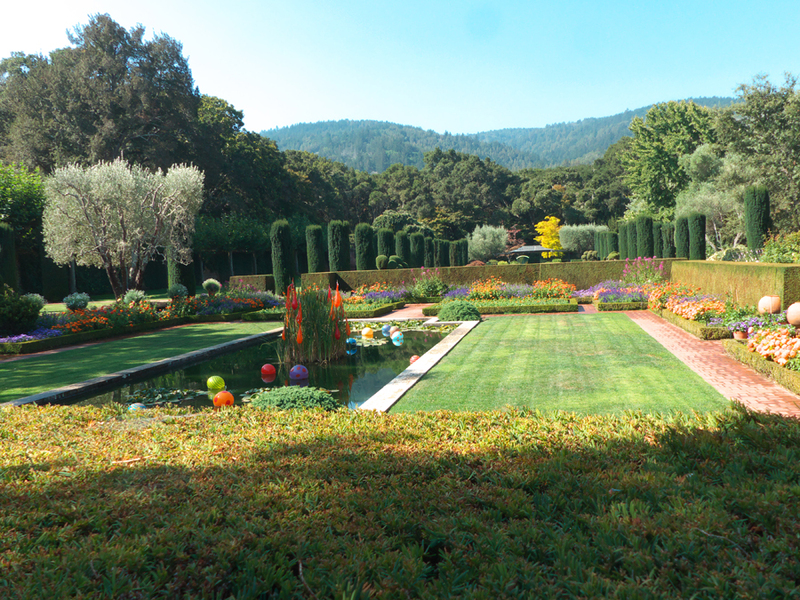 The William P. Roths purchased Filoli in 1936 after the death of the Bourns. 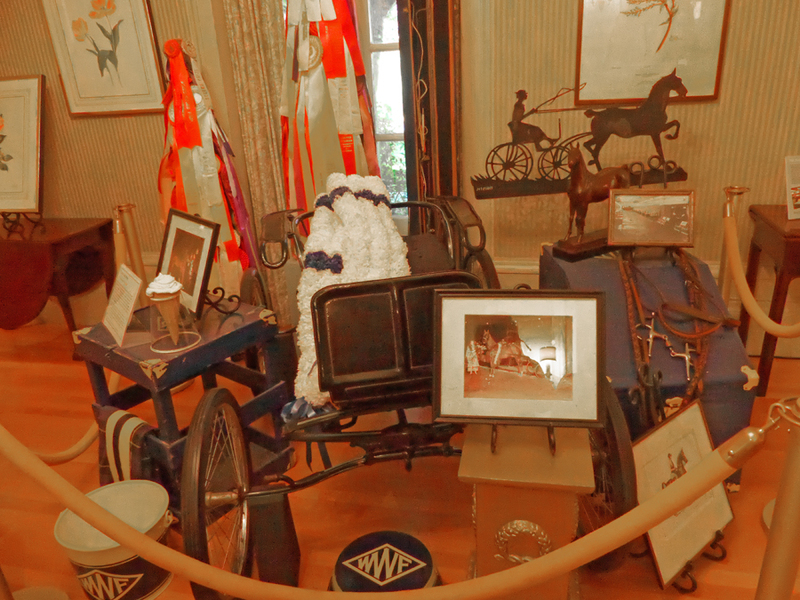 Mrs. Roth was an accomplished horsewoman and won many trophies. Some are displayed here. The servant's domain is equally fascinating. It was remodeled by the Roths between 1959 and '61. The kitchen is filled with every gadget imaginable. You can imagine a chef and several sous chefs busy chopping and dicing at the generous counter space the cooking for a small army on the huge commercial type electric stove. The original oil fired stove of the Bourns era was replaced by this one. 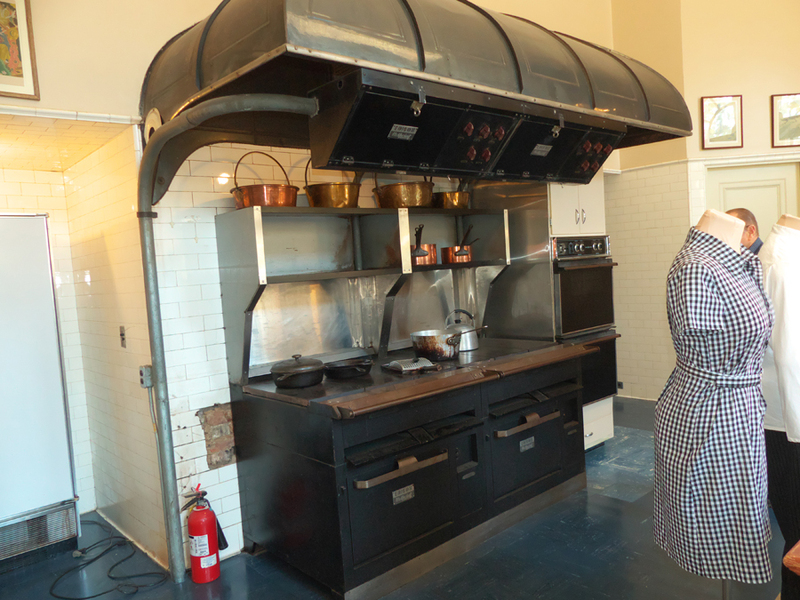 Wouldn't it be fun cooking on that stove? Just as you got a glimpse of the Bourns and Roth's private lives in the rest of the home, here you get to know a lot about the staff particularly Chef Kee Low. He was the creative genius who ruled over this kitchen for over 40 years. I have saved the best for last. The mansion although beautiful is static; the gardens are a living bridge between then and now. Portions of the garden were begun in the 1917s. Almost a century later they are still filled with beauty. Nature and art intertwine so perfectly here. Just as a house has rooms think of the gardens as rooms. Each is different; each is beautiful. Due to time constraints we could not get to all but the ones we did visit were breathtaking. Our first stop was the small retail garden just south of the house. It is a cozy space surrounded on three sides by the house to the north and the garage to the east and south. The garage is topped by a clock visible from most points in the garden. The garage is topped by a Christopher Wren style clock tower. The ivy covered brick walls, tinkling fountains and brick walkways give a feeling similar to the French Quarter gardens in New Orleans. You could settle in with a good book and a glass of iced tea here and be quite comfortable. This is the place to buy a unique living souvenir. 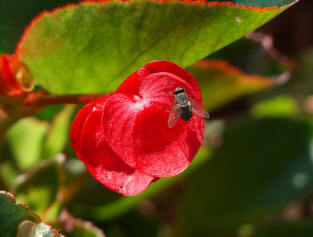 Had I not been flying I would have been tempted by the ornamental pepper plants or salvias for sale. Next stop was the formal style Sunken Garden. Like most of the gardens this is a very private space. It is very much the structured English garden with hedges. The eye candy here is a composition of red-orange Chihuly glass art mingled with real cattails set in a square pond with brightly-colored floating glass balls, water lilies and other aquatic plants. With the Santa Cruz Mountains for a backdrop, this might be one of the prettiest spots in the world. Behind this was the swimming pool and it's not your run of the mill cement-with-lawn-chairs-around-it pool. It is surrounded by lots of green space, some ornamental plants and tall Irish yews. We were greeted by Percy the Peacock. 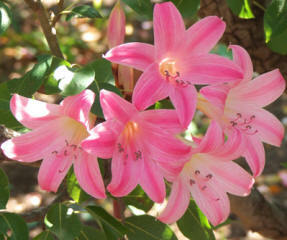 As I browsed the gardens each group of flowers was more beautiful than the last. It's almost impossible to pick a favorite. The shapes and colors are perfect. After hearing about the heirloom fruit grown in the orchard it was fun to see it in person. The pears and apples were hanging just waiting to be picked. 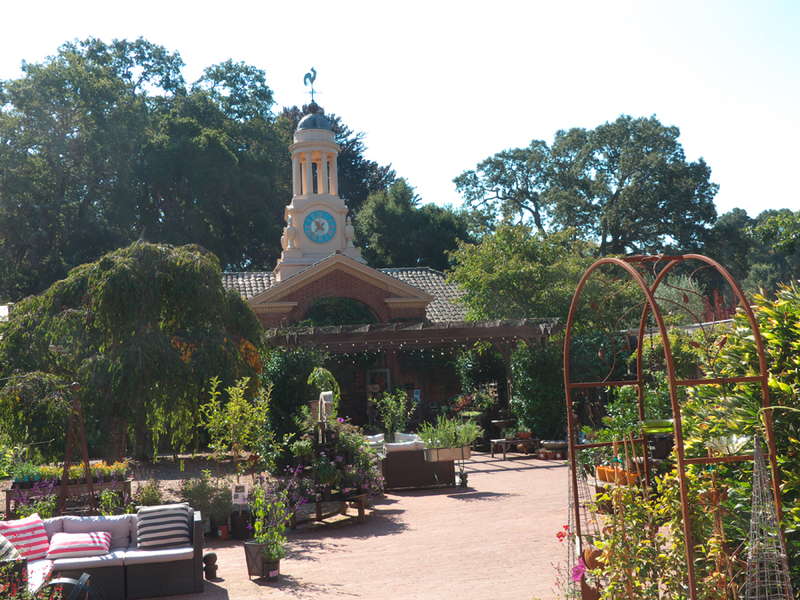 They even grow olives here at Filoli. Don't those apples look tempting. All too soon we had to depart for our next adventure. As we left we were seen on our way by a clever sculpture called English Bulldog by a California artist, Patricia Vader. What a way to spend a fun day.